Plenty of people were surprised not to see Ed Cowan's name on the list of Cricket Australia's contracted players for 2012-13, released on Friday. Cowan was not one of them. Ever the realist, he knew that he remained in the selectors' immediate plans for the Test side, but that they wanted more than the solid starts he has provided during his first seven matches in the baggy green. He wanted more too. Since he was called up for the Boxing Day Test, Cowan has played a full series against India and all three matches on a tour of the West Indies, and has shown that he is not out of his depth at Test level. But nor has he made himself indispensable. Test scores of 68, 8, 16, 74, 30, 10, 14, 34, 28, 20, 1 and 55 highlight Cowan's potential, and he said he was not surprised that more would be expected of him to earn a central contract, especially with contract numbers slashed from 25 to 17. "I wasn't shocked," Cowan told reporters in Brisbane on Saturday. "I was naturally disappointed, but at the same time I think it's great for Australian cricket that it is going to be so competitive for contracts moving forward. We've seen in the past with too many contracts, guys earning contracts and then not playing through an entire year. With the opportunity to play and earn an upgrade it leaves Australian cricket in a really good and competitive place. "I've had a great opportunity to cement that spot at the top of the order and I probably haven't scored the runs that I probably should have scored. That conversation could have been ended pretty quickly with a couple of Test hundreds in the last seven Tests. I'm looking forward to hopefully opening the batting for Australia come the Gabba in November, putting some runs on the board and earning my way back on to the contract list. I think that's a really great incentive to keep the fire burning in the belly." The selectors have told Cowan that he is firmly part of their blueprints for the Test side, although those plans are long-range at the moment, with no Tests on the agenda until South Africa visit in November. For now, Cowan is in Brisbane preparing for the Australia A tour of England in July and August, a trip on which he will be both captain and opening batsman. 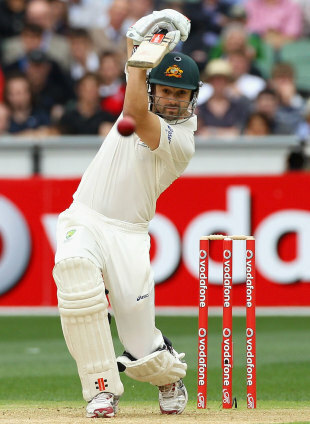 The tour will provide Cowan with a valuable opportunity against high-quality opposition in English conditions ahead of next year's Ashes. His vice-captain is Peter Forrest, who is on the fringes of Australia's Test side, and other batsmen on the tour include George Bailey, Liam Davis, Joe Burns, Tom Cooper and Michael Klinger. The selectors will be keeping a close eye on how the Australia A batsmen perform, especially given that only six specialist batsmen were handed Cricket Australia contracts for the coming year. The selectors might still be undecided on who from that next tier of batsmen can make the jump to international cricket, but Cowan believes there is more batting depth at state level than the contract numbers indicate. "I think there's some really great batting talent coming through," he said. "There are some really strong young players, not only those guys on the A tour but guys who are pushing for selection on the A tour, guys like Bobby Quiney and Nic Maddinson, and even Phil Hughes and Usman Khawaja, who aren't on that tour. There are a lot of batters around. "The state of domestic wickets has been more conducive to fast bowling in recent seasons and it has made those big thousand-run seasons really hard to come by. At the same time, I think we'll see the benefits of that as well. Batters are having to tighten up their techniques and really respect the new ball and probably never feel as in as they could. But they'll reap the benefits as their game develops further down the line, to really appreciate when they do get on some good wickets and they'll cash in."